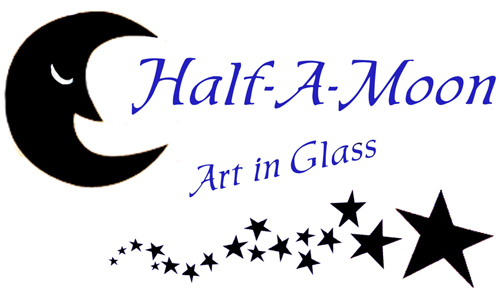 Half-A-Moon started in Glasgow in 1987, then relocated in 1992 to Inverness; the capital of the Scottish Highlands. In 2000 the studio moved out to Ardersier, 10 miles east of Inverness, where you will find us on the old military road from Cawdor to Fort George (B9006). 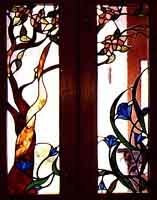 We are specialists in the art and craft of designing and manufacturing stained glass in both traditional leadwork as done by the medieval monks across Europe for centuries and copper foiling as invented by L.C.Tiffany around 1880. We can make anything from a small light-catcher to a large panel. Our range includes clocks, lamps, mirrors and candleholders as well as pieces for your windows or even the windows themselves!!!! We also do fused and slumped glass, we have a range of 'hot' glass bowls and platters, from small trinket bowls to large display dishes. We also have a range of one-off fused panels, mainly on the theme of the sea, each one is unique so you will get a piece of art that no-one else will have. Occasionally we are asked to collaborate with other makers who work with different materials. We have done a series of framed silk paintings with Heather Butlin and from 1996 until early 2003 we worked on a range of complementary wrought iron with Alba MC. This included unique "metal" mirrors and "glass" weather vanes. We produced exhibition pieces using the skills of both stained glass and wrought iron as well as some more 'everyday' items. We sell from our studio as well as through various retail outlets throughout both Scotland and England. We rarely exhibit at trade fairs and craft fairs. If you do meet us at a show let us know that you found us on the web. If you are going to be in our area contact us so we can give you directions to the studio and then come and see us at work. We are usually open to visitors Tuesday to Saturday from 11am to 4.30pm, February to December. You may catch us still working there at 11pm sometimes! It is best to give us a phone before visiting just to check that we are in and open as we may be away delivering our latest creation.